Boy Scouts of America, Alamo Area Council, announces its participation in the soft launch for our Charter Organizations supporting their Cub Packs ready to invite girls to join Cub Scouting from January to May of 2018, with the “official” full launch date set for the beginning of the 2018/2019 school year. The soft launch will be open to girls currently in kindergarten for Lions, and girls in the first through fourth grades in Tigers, Wolves, Bears, and Webelos I. (Webelos II girls will have to wait until January 2019 when the older girl program is launched). The National Executive Board unanimously decided to better serve families by welcoming girls to join the Cub Scout program in 2018, and BSA is now offering qualified Councils the decision as to “when” they may register their first girl dens and packs. Existing packs may choose to establish a new girl pack, establish a pack that consists of girl dens and boy dens or remain an all-boy pack. Cub Scout dens will be single-gender — all boys or all girls. Using the same curriculum as the Boy Scouts program, the organization will also deliver a program for older girls, which will be announced in 2018 and projected to be available in 2019, that will enable them to earn the Eagle Scout rank. 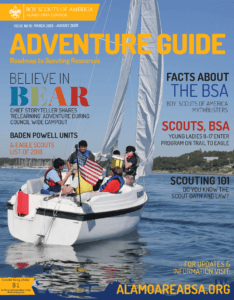 Although known for its iconic programs for boys, the BSA has offered co-ed programs since 1971 through Exploring and the Venturing program, which celebrates its 20th anniversary in 2018. This unique approach allows the organization to maintain the integrity of the single gender model while also meeting the needs of today’s families. Our priority is to bring the benefits of Scouting to more youth while remaining true to our mission. “The Alamo Area Council might get 200 new girls in the program and we might get 20,000 girls in the program, but we do know we are all in this together in service of youth and excited to welcome them and their families into Cub Scouting come January 2, 2018,” said Michael de los Santos, Scout Executive, Boy Scouts of America, Alamo Area Council. Whether a charter organization decides to participate in the soft launch or waits for the official roll-out later in the 2018 year, this historic change will help sustain our mission of preparing more young people to live the values of the Scout Oath and Scout Law. Thank you for your continued efforts to bring the benefits of the Scouting program to even more young people across our country. “Communities need unity to thrive. I am excited to have the opportunity to work together with so many great organizations in this area to make a positive impact on the lives of our youth. The investments we make with our time, energy and resources to build the character and leadership of our youth is a proven way to strengthen our future. Join us in the Scouting movement to positively impact the lives of all youth!” said Jim Jeffery, President, Boy Scouts of America, Alamo Area Council.